DocoVid: Amnesty in wartime. Assad pardons former Syrian militants. Video documentary of army training and interviews with former enemies of the Syrian Army who have sought amnesty and now train to fight for Syria: "On several occasions since 2011, Syria’s President Bashar al-Assad has offered amnesty to anti-government militants who lay down their arms. Amnesties are usually offered to former combatants after are conflict ends, in Syria though they’re being granted as the war rages on. Men who haven’t completed their mandatory military service, are returned to the Army and serve in special “Amnestied groups” where they will fight with the government forces they once opposed. Read more about DocoVid: Amnesty in wartime. 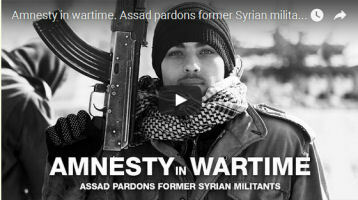 Assad pardons former Syrian militants.